Dr. Slick’s Jumbo Fly-tying Tools are easier to pick up off the table and grasp than other types of fly-tying implements. Each of these tools costs about $10. LEARNING TO TIE flies requires time and patience. You have to study what fish eat, learn about the different tying materials, and practice fashioning these ingredients into finished flies that catch fish. It’s easy to get overwhelmed, and using poor-quality tools will make the experience more frustrating. Or maybe you’re an experienced tier — not an expert, but you’ve learned the basics and are catching fish with your flies. You enjoy tying and are ready to explore new patterns and tying methods. The first step to increasing your tying ability is to make sure you have the best available tools. Regardless of your experience, using the right tools will make your tying more enjoyable and productive. For only a few dollars more, you’ll be able to buy the best tools on the market. The Anvil Industries Streamside Kit ($69.95) contains a selection of four scissors. With this kit you’ll be able to cut any fly-tying material. A vise is the first tool you’ll purchase. Next, you’ll need scissors, hackle pliers, and a few other odds and ends. Let’s examine the small tools you will need in your fly-tying toolbox. Purchasing a kit of quality tools will put you in the fast lane to tying flies. Orvis’s Masters Series Tool Set ($79) contains hackle pliers, scissors, a whip-finisher, a bobbin, and more. When examining scissors at the local fly shop, don’t hesitate to take the tool out of the ziplock package to try it. Note the material and quality used to manufacture the scissors, and ask yourself whether it will match your style of tying. When test-driving a pair of scissors, place your middle finger and thumb in the loops to check for fit and comfort. 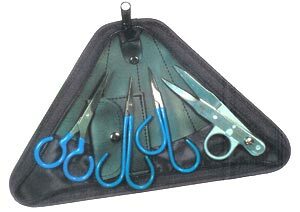 They should rest comfortably well below your first knuckle on your thumb, enabling you to manipulate materials with your thumb and index finger while continuously holding the scissors in your hand. Generally, 3- or 4-inch-long scissors with large looped holes work best for this purpose and are highly recommended for novice tiers, but a long pair of scissors might be more appropriate for cutting deer hair for Muddler Minnows or tying large saltwater flies. Scissors with fine. points will allow you to cut hair from closer to the hide, but selecting scissors with either curved or straight tips is a personal choice. Many expensive scissors, however, come with straight tips only. While high-quality scissors usually cost a little more, there are many decent, reasonably priced scissors on the market. 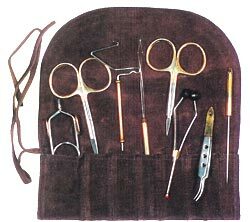 The Dr. Slick company, for instance, offers scissors in a range of styles and prices. Dr. Slick’s stainless-steel Arrow Scissors ($9) have 3-inch-long blades and fine points for detailed cutting, and the base of the blades contain a notch for cutting heavy materials such as Mylar and tinsel. These scissors are an excellent first choice and will serve you well. If cost isn’t a barrier, check out Dr. Slick’s Razor Scissors ($20.75). These scissors are a new product and are advertised as the sharpest available. Razor Scissors have adjustable tension, nonserrated blades for smooth cutting, and are made of high-grade stainless steel. I tested the Razor Scissors, fell in love with them, and haven’t used another pair of scissors for fine work since. 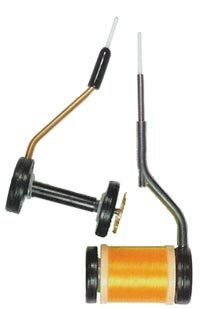 Griffin Enterprises manufactures a wide variety of fly-tying vises and tools. 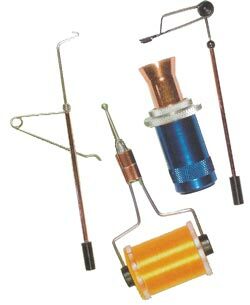 Look for Griffin’s Rotating Whip-Finisher ($7.25), Magnum Ceramic Bobbin ($11.50), Hair Stacker ($11.50), and Rotating Hackle Pliers ($7.95) at your local fly shop. 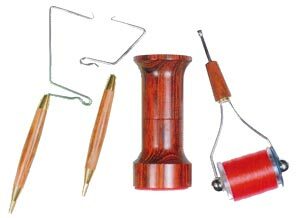 Bobbins are seldom discussed as a critical fly-tying tool. There are many different styles of bobbins, and some have important features that make tying more productive and fun. It’s crucial to select a bobbin that has a ceramic tip in the tube. If your tying thread keeps breaking, it may not be due to the tension you are placing on the thread. Thread often snaps from the friction of the material against the tip of the tube. A bobbin with a ceramic tip significantly reduces this problem. 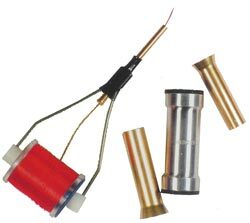 Some bobbins have ceramic inserts at both ends of the tube, which minimizes the friction where the thread enters and exits the bobbin. Basic bobbins cost five to seven dollars and have stainless-steel or brass tubes. These simple tools cut the thread more readily than ceramic-tipped bobbins. Griffin Enterprises and Dr. Slick produce high-quality ceramic-tipped bobbins ($7.25 to $10.95). A bobbin with a titanium oxide tip ($11.75 to $13.50) does an even better job of reducing thread-snapping friction. The tools offered by Wasatch Custom Angling Products are functional and beautiful. Almost all their tools feature cocobola handles or parts. These whip-finishers ($12.95 apiece), large hair stacker ($16.95), and ceramic bobbin ($12.95) are typical of their fine work. Tying off the thread is the final step in completing most flies. Learning to tie a whip-finish knot can be frustrating. While you can learn to tie a whip-finish by hand, a quality whip-finishing tool makes it easier. Select a whip-finish tool that has a rotating handle. A less expensive tool with a stationary handle is harder to use because you must rotate the tool between your fingers while whip-finishing. The size of the handle can also make a difference; a thicker handle, such as the wooden handle on the Wasatch whip-finishing tool, is more comfortable for many tiers. And remember that if you are left-handed, the hook at the end of the tool must be in line with the handle; if the hook curves to the right, it will be impossible to tie a whip-finish. 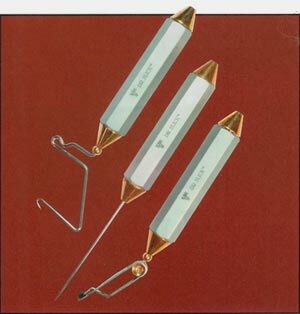 Renzetti, Inc., is one of the world’s leading manufacturers of fine fly-tying vises. Renzetti also makes a line of smaller tools. The tube on its Standard Bobbin ($18.50) has a flared bottom and ruby tip to protect fine threads. Renzetti’s unique Double Ender Hair Stacker ($14.95) contains two hair stackers in one tool. Don’t overlook the importance of using quality hackle pliers. Good hackle pliers will hold the feather securely without breaking off the tip of the hackle. Many tiers prefer the simple English type of hackle pliers; you’ll find these in every fly shop. English hackle pliers are quite affordable ($2 to $6) and perfect if you are just starting to collect your tying tools and materials. Some hackle pliers have rotating handles, similar to the handles on whip-finishers. Pliers with a rotating handle help prevent the hackle from twisting while wrapping the feather around the hook. If you plan to tie bucktail streamers, then a good hair stacker is indispensable. I recommend a hair stacker that has a brass base because the extra weight means you’ll have to exert less energy when tapping the tool to straighten the hair tips, and the tool is less likely to tip over on your bench. Hair stackers are also made out of aluminum, and some are crafted out of fine woods. There are a few other tools that will make your fly-tying life easier. A bobbin threader helps string the thread through the bobbin and cleans out the excess wax that collects on the inside of the bobbin tube. Choose the bobbin first, and then choose a threader of the appropriate length. A bodkin, which is a thick needle with a handle, is very helpful for performing a variety of tasks, from picking out guard hairs to applying cement to the head of a fly. A hackle gauge is a handy tool for tying dry flies; use it to learn the proper length of hackle fibers for different hook sizes. 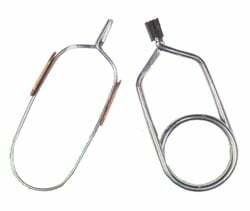 All fly shops carry English hackle pliers. These simple tools cost about two dollars apiece. Bill Merg, the head honcho at Merco Products, developed the Rite bobbin more than 20 years ago. The unique Rite bobbin allows you to easily adjust the tension on the thread. Here we see the Rite standard bobbin ($19.99) and ceramic magnum bobbin ($29.99). A successful fly tier has fun while creating durable flies that catch fish. Having the right tools is the first step to enjoying this wonderful craft.